transcosmos inc. (Headquarters: Tokyo, Japan; President and COO: Masataka Okuda) launched “ARmadillo PLAYER,” a new general AR app as a new menu to “transcosmosARmadillo,” its one-stop service that enables businesses to easily implement and utilize Augmented Reality (AR). Unlike virtual reality (VR) which is detached from reality, AR is a technology which expands user’s experience by adding digital information to the real-world. Based on the theme of “practicality” and “high-reality,” “transcosmosARmadillo” was developed for clients that face challenges in implementing and utilizing AR and was released in September 2018. So far, it has been offering services that include custom AR app development, AR content development, and a content management system (CMS) at one-stop. 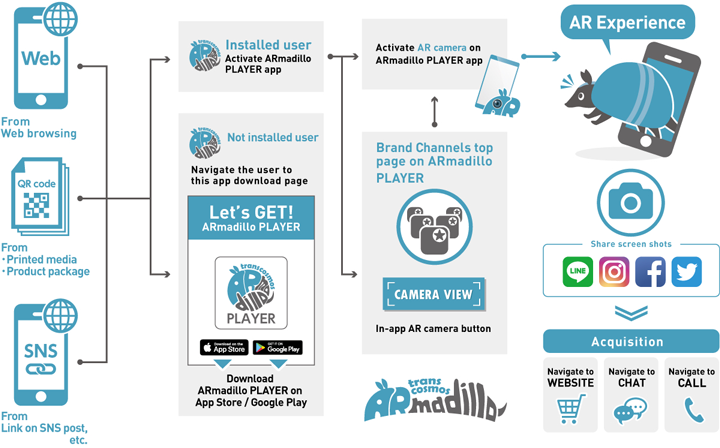 Now, transcosmos has launched “ARmadillo PLAYER,” a general app which lets clients execute AR initiatives in order to deliver AR experience to consumers more easily than ever before. Equipped with “ARKit” and “ARCoreTM,” the genuine AR engines for iOS and Android that have a spatial perception feature, the app enables clients to deliver a realistic AR experience. Clients can use the app by opening a designated channel to “ARmadillo PLAYER” registered on App Store and Google Play. Once AR content is registered on its CMS “ARmadillo CLOUD,” URL and QR code will be issued automatically. Clients can invite consumers by putting the URL and QR code on their SNS messages, websites, printed media, product packages, etc., and let them enjoy an AR experience by presenting various AR contents to the real-world, that ultimately boosts consumers’ buying appetite. *Usage fee varies for services that exceed above limits. In Japan, almost all AR initiatives taken are only for a short-term goal such as for marketing events and campaigns due to the costs and man-hours required to develop AR content. transcosmos developed “transcosmosARmadillo” to help clients that face challenges in adopting and utilizing AR technology for their marketing activities with the aim to deliver services that help them expand their sales through taking long-term AR initiatives. Going forward, transcosmos plans to add AR ad menus to “transcosmosARmadillo” as well as delivering customized versions that target each industry. What’s more, the company will help clients enhance their abilities to solve problems by organically connecting this new one-stop service to its existing services with a goal to implement “transcosmosARmadillo” to 100 companies by FY2020. transcosmos continues to offer extensive support for clients’ marketing activities whilst enhancing its AR-related services. *iPhone and the Apple logo are trademarks of Apple Inc., registered in the U.S. and other countries. App Store is a service mark of Apple Inc.
*Android, ARCore, Google Play and the Google Play logo are either registered trademark or trademark of Google LLC.